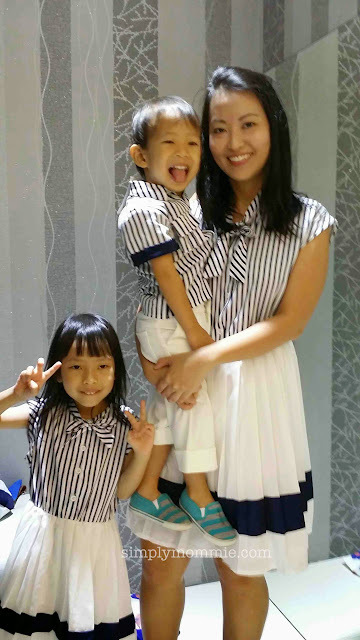 Thanks to the kind folks at Glitter Glam, I’ve finally been able to doll up in matchy matchy outfits with both my children. Considering the fact that I have a boy and a girl, I think to have matchy outfits with both of them is just kinda awesome. 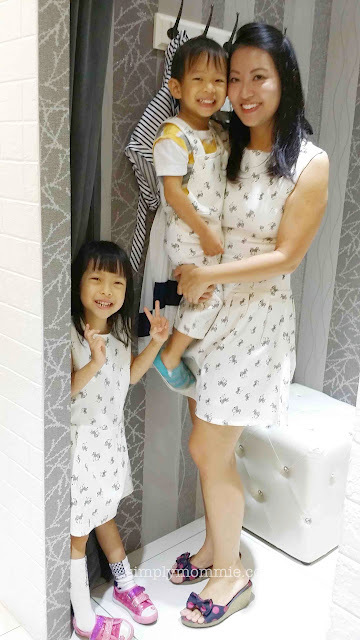 I’ve seen the matchy girly dresses for moms and daughters at Glitter Glam x Mary Had a Little Lamb (but I was pleasantly surprised when I reached the store and was told that there are actually two designs that have matching outfits with boys as well! Needless to say, we tried both the designs. The first design I’d say is made of really very soft comfy fabric. I know nuts about types of fabric – I only know whether it’s comfy or not so bear with me. There’s lining for the skirt portion so there’s no need to worry about whether it’s too translucent. 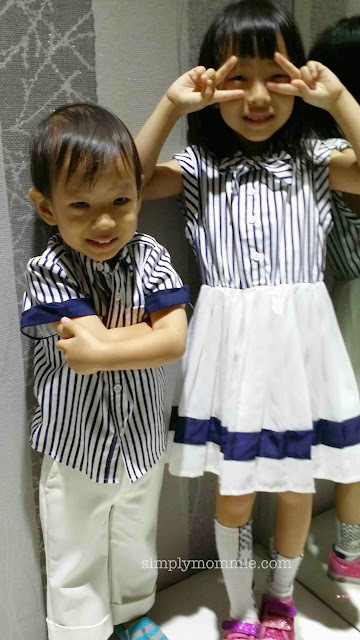 The girl’s outfit is exactly the same as the mum’s while the boy’s outfit is a short sleeved shirt (with the same striped design) with smart white pants. My boy looked super cool while my girl looked very sweet. I, erm, looked matchy. The waistline of the dress is a little too high for my liking but yeah, I’ll get used to it. We all need to try something new to make life more colourful eh? The second design features zebra prints. The boy’s version is a jumper (my boy is wearing his shirt under as the jumper is sold without any inner shirt). I personally thought this dress was more flattering for my body shape, focusing more on my *relatively* flat abdomen and overall clings better to the body, partially because of the type of fabric used. But that’s my preference. These dresses are honestly very pretty but not so flattering for me because my thunder thighs just don’t go well with short skirts. They’d look great on those of you who are blessed with long, slender legs. 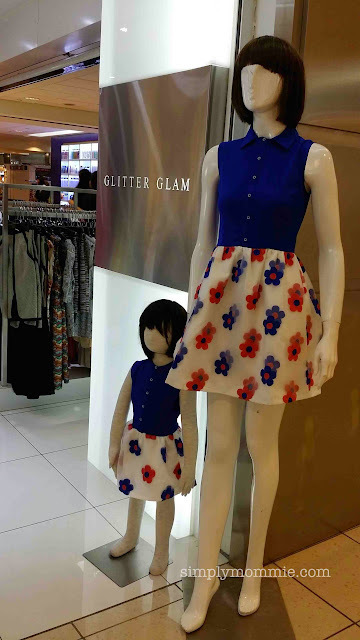 I first came across Glitter Glam at Isetan NEX, not knowing that they actually have the matchy outfits with daughters as only the boutique at Harbourfront Centre and selected Isetan counters carry the mother-daughter wear on top of the clothes for women. Glitter Glam is a home-grown brand that’s characterised by a work wear collection with an edgy character, yet provides great comfort and excellent fit at the same time. They are also one of the favourable wardrobe sponsors for the TV station and various production houses. Now here’s the giveaway! Glitter Glam is kindly sponsoring a mother-child outfit for my readers! This contest is open to all moms in Singapore with EITHER a son or daughter, aged 1-6 years old. Remember to follow the steps in the Rafflecopter widget below to qualify! Mary Had A Little Lamb was conceived on Mothers’ Day 2013 with the brilliant idea of shrinking a mummy’s wardrobe into a mini-me version for her little one. The first ever collection was the mother-and-child outfits. Going on from here, Mary Had A Little Lamb wishes to produce unique and modernistic outfits for toddlers and pre-schoolers. Glitter Glam will be participating in the upcoming Parents World Babies & Kids Exhibition 2014 at Expo where there will be very attractive promotions. Do remember to check out their booth! Disclosure: We were gifted the set of matching outfits. All opinions are mine. 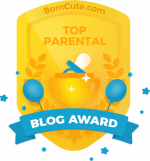 This entry was posted in Beauty, Beauty and Fashion, Fashion, Giveaways, Reviews and tagged Clothes. Bookmark the permalink. a good experience for both of us. I am so glad to find there is one shop glitter clam at harbour front centre #02-110 that provide matchy-matchy dress for mother-daughter.First time I came the lady looks friendly,we tried on the dress looked very cute but we didn’t bought one as we still want to look around…the other day I came again as I want to buy one for family event,the lady looks unfriendly,surprisingly she still remember me and the size of the dress that i tried before,I feel so dissapointed with her unsmiling and unfriendly service to me. I am wondering is there any obligation that customer who tried on the dress should buy the dress on gliiter clam? 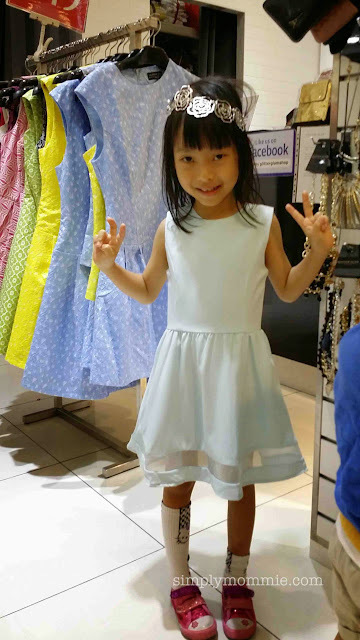 I just feel it is unfortunately even the shop provide very nice cute dress for matching mother- daughter but if the service is very bad,the customer won’t be happy to shop there too. I wish in the future glitter clam @ harbourfront center will provide better service to attract more customer to come and share the the joyous moment between mother and daughter and of course with the lady in the shop. Hmm, perhaps it just happened to be a bad day for her! There shouldn’t be any obligation to buy the dress you tried! 🙂 I hope you’ll have a better shopping experience in future!